Palazzo: Chennai’s Grandest Restaurant is NOT a Restaurant!! 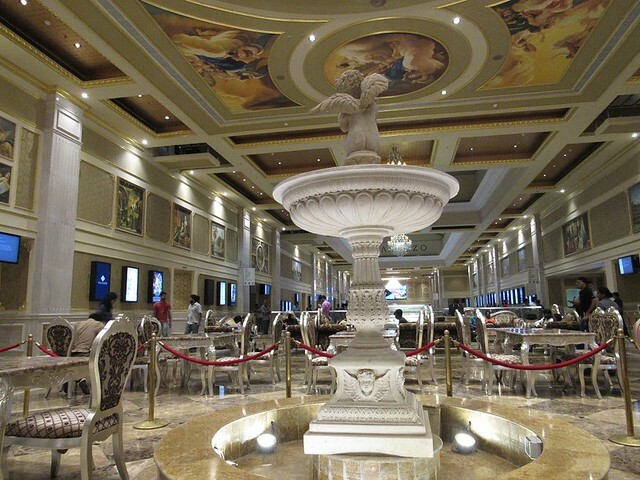 SPI Cinemas Palazzo is a grand-looking restaurant (other than star hotels) in Chennai. It has one of the best royal decor I have seen. But wait – this is not a restaurant. It’s located amidst a ticket booking counter and movie halls at SPI Cinemas, Forum Mall, Chennai. The chairs and tables are for people to buy and eat snacks/fast food. You don’t have to book a movie ticket to go and eat here – you can just walk in and buy anything off the counter. Of course, there are no waiters or chefs. You get only those ready-to-eat items that you find in Sathyam Cinemas canteen. But the settings, lighting and the feel of the place is majestic – better than most restaurants. You’ll have to visit the Forum mall (Vadapalani) to experience it. A golden hue reverberates everywhere – The chairs/tables have a royal touch, there are large Italian paintings on the sidewalks and ceilings, there are huge chandelier lights, giant LCD screen (which plays movie trailers) and many smaller screens, sculptures, etc. The lighting is too good. The venue is huge and spacious. Even the rest rooms are palace-themed! Here are some more glimpses from their website. Yup.. very soon a grand restaurant is on the way there! La Piazza!